To see the Butterfly Potager garden at other times of the year, click here and scroll down. Peeking into this area of the Butterfly Potager, you can see some delicate-looking fronds of asparagus sticking up behind daylilies, and a golden hops covering the trellis. What a beautiful week-end! With this heat wave, I will soon have many more spring bulbs blooming in the garden. But here's one of the things popping up already - tiny, electric blue siberian squill in a hot spot between the patio and house in my Butterfly Potager garden. I wish I was able to take pictures to do this little baby justice. If you wish you had some early spring bulbs blooming right now, consider adding some of this next fall. It comes back perennially and even multiplies. And the colour is fantastic! Garden ornaments always seem to look better when they've got a little bit of foliage touching them. It's almost like Mother Nature says "Oh yeah, you think that thing looks nice? That's nothing! Let me show you what I can do!" Of course, Nature is probably much more polite than that. She doesn't need to be competitive, she just works her magic. To see this garden at other times of the year and how it has evolved, click here. Sadly, it's looking a litle sparse in a couple of places this year for three reasons: One, I mulched heavily last winter which is good for the soil and all, but this year I didn't find that any of my self-seeding red poppies nor my golden hyssop came back! Boo. Actually, there are a couple of poppies growing through the patio stones which I will let grow so that I can save seeds for next year. The second reason is that I planted asparagus this spring in those little diamond raised beds, which will take a couple of years to fill in. The third reason is that I didn't get around to planting scarlet runner beans on that bamboo trellis until very late this spring. I only ended up with two plants growing and they are still very small. I had the best of intentions this spring but the weather and a few trips out of town set me back quite a bit in terms of getting things done. Above (clockwise from top left): golden hops; window box full of annuals; calendula (annual from seed this spring) in front of lemon thyme; row of calendula in front of asparagus in raised beds with perennial Jacob's Ladder in the background; unknown variety of dianthus that someone gave me seeds for (first bloom, started from seed last year) in front of John Cabot rose; close-up rose; close-up of dianthus. Above: lilacs are still blooming; asparagus (planted this spring) is getting ferny; Jacob's ladder and martagon lilies are starting to bloom in a shady corner; peony opening up; and calendula started from seed is beginning to bloom. My poor photography skills just do not do justice to this light, feathery grass which is dancing in the wind out there right now. It is growing in part shade and seems pretty happy there. Above: As you come around the south side of the house, you enter the Butterfly Potager garden. This year the honeysuckle growing on the arch seems to have died back to almost the ground and I need to cut it back. Above: The lilacs are in bloom right now as well as a few shade plants: pulmonaria and lamium. More photos clockwise from top left: goldenrod and raspberry monarda; golden hops, hyssop, purple liatris and raspberry monarda; siberian iris foliage looks good even when not in bloom; swiss chard has been harvested; sedum 'Autumn Joy' in bloom; liatris, hyssop and monarda again. It's sad to think that the garden is only going to look like this for just a few more days... snow forecast on the week-end! Ugh! Perennials blooming right now: monarda (bee balm), eupatorium (Joe Pye weed), hydrangea 'Annabelle', agastache foeniculum (golden hyssop), purple hemerocallis (daylily), purple clematis, rose 'John Cabot', ornamental grasses, and a new goldenrod that I got from the Plant Share last week-end. Annuals blooming right now: calendula, dill, poppies, zinnias, nasturtiums, allysum. Other: swiss chard - why have I not grown this vegetable before this year? I have been harvesting it all summer and it's still looking and tasting great! I will be freezing the rest for winter cooking soon. Above: nasturtiums in the window box and purple clematis on the right; that's a new little red lobelia near the bottom of the rain barrel. Above: A little closer in and from the bottom up you can see some daylilies, calendula, hyssop, dill and nasturtiums. Above: This is inside the gate now looking back towards it: purple clematis with a John Cabot rose still blooming; sedum 'Autumn Joy' getting ready to turn colour (ack! that means it's fall!) and golden hyssop. Above: A mishmash of dill, red annual poppies, zinnias, calendula, swiss chard, raspberry beebalm, golden hyssop and purple daylily... oh, and some pink yarrow which I must move out of there - I don't know where it came from and it's clashing with everything! Above: nasturtiums, orange violas and thyme. And some close-ups for you as well, clockwise from top left: raspberry monarda (beebalm) with golden agastache foeniculum (hyssop); unknown clematis with calamagrostis (feather reed grass) 'Karl Foerster' and white snapdragon; more hyssop in front of the purple clematis; zinnias; clematis. This garden features either edible plants or ones that attract hummingbirds and/or butterflies (but I thought the name "hummingbird butterfly potager" was too long). On the annual side the red poppies, orange and yellow calendula, dill and nasturtiums are blooming away, although the poppies are petering out. There are also red lilies, raspberry monarda (bee balm), a yellow-leaved agastache foeniculum (hyssop), purple daylily, and purple and magenta clematises (clemati?) in bloom right now. We can barely keep up with the 'Bright Lights' swiss chard so I'll be freezing some soon. I'm happy to report the two columnar crabapples I planted last spring are now taller than the fence and seem happy and healthy. They must be OK with the amount of sun they get even though they're on the north side of the fence. something bright and shiny for the butterfly potager! What can I say... I can't resist the colour blue. another comment was that some vines on the fence would create more lushness. I disagree - I think that would take away from the framing effect of the columnar crabapple trees, which are only one year old and will get fuller in a few years anyway. Plus there's already 4 large vines (2 clematis on the house wall, 1 golden hops on the garage wall, and 1 honeysuckle on the arch) and 2 climbing roses (John Cabot and John Davis, each planted with a clematis) surrounding this small patio. Granted, the roses are still small so we will have to wait a couple of years to see their full glory. Judges commented on the poor condition of the "temporary stairs" nearby. This is one of many things I said last year needed to be fixed and it hasn't been done yet. Sigh. Judges did like the little raised beds for veggies I put in here. Hooray! Validation! I like them too! There was one comment on weeds in the brick patio. I thought I got rid of them all before I left on holidays. Mental note to not go away during the judging period next time... did I say that already? lost marks for not being weed free and debris/clutter free. Like I warned you, I don't really have the time to get my garden up to competition standards. There are always a few weeds. But I was going for feedback on other topics and now I have a few things to think about which is exactly what I wanted. Thanks judges!! for the record: gas meter almost invisible by June 21! Finally, some nice pictures to show you again! I have been posting a series of reflections (starting here) on each area of my garden this year. The last few posts have been brutally honest, and rather unflattering. They are certainly not photos to show you how perfect my garden is - but rather, wide, uncropped, unedited photos to help me analyze what I want to change and improve next year and to show my garden as a work-in-progress. But I'm proud to say that the butterfly potager did well this year and other than a few minor changes, the plants can settle in and make themselves at home. Mid-May. This area can be seen from the master bedroom window and looked boringly barren in winter, so the first thing I did this spring was start to add structure by planting two columnar crabapple trees. They're on the north side of the fence but I'm hoping once they get tall enough to get lots of sun over the top of the fence, they will thrive here. Mid-June. Due to the shade of the fence things are a little slow to take off here. 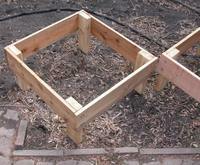 Plus I added these stepping stones to the garden this spring to provide easier access to the veggies and bench. This bench was just temporary while I was finalizing the design. Late June. The new bench in place. Allium 'Purple Sensation', some iceland poppies and siberian iris in bloom. Direct-sown seedlings of peas, carrots, beets and beans grow left to right on the trellises and in the raised beds. Early July. Top photo: Rosa 'John Cabot' and hesperalis matronalis in bloom here. I'm going to add some of the chartreuse-leaved agastache foeniculum here next year for even more colour. And um, a toy on the patio... Middle photo: View from the back porch. Bottom photo: A nice mix of foliage with a young martagon lily in bloom. Mid-July. That big sun on the garage wall is new this year. I like it! I think we should all hang more stuff on our outside walls. Late July. Picnic table painted. Looks better! Roses, delphiniums, and poppies in bloom. Mid-August. Roses, clematis, lilies, 'Annabelle' hydrangea (new this year), scarlet runner beans and daylily in bloom. I've added a trellis to the garage wall that I plan to grow golden hops on next year - it should look great on the blue background! Late August. The dog stepped on the lilies so I rescued them. Mental note to put cages around the lilies next year... Also note the new, cute little decoration over the bench! Early September. Peas and beans are finished so the teepees have come down. Purple clematis, red poppies, self-seeded verbena bonariensis, red bee balm, yellow hollyhocks, purple agastache foeniculum and hosta in bloom. I moved the hosta right after this picture was taken - it looked great here but it was getting a bit crowded and I had a spot in the new back shade garden that needed it more. How much foliage variation is too much? Even though they're not blooming, I think the foliage of baby's breath and Karl Foerster feather reed grass also look great with these plants. The white petunia is an annual so I can change this vignette every year. What else do you think would look good in the pot? reorganize the butterfly potager... check! Way back in winter I decided to redo the "butterfly potager garden". Basically, I wanted to have something more interesting to look at than that barricade-of-a-fence that my neighbours put up. So, I planted the trees, and I want to get a concrete bench and some kind of year-round ornament to put on the fence above it. That meant I had to move all the plants around because I needed to put in some stepping stones to get to the bench... these projects never turn out to be small! Anyway, I'm finally done. I've put in the stepping stones, planted various kinds of low-growing thymes around them, and moved around the perennials that used to be there (delphiniums, lilies and bee balm). There are peas and beans planted to grow up the two teepees, and carrots and beets in the two little raised beds. So come on summer, I'm ready for ya! Here is the beginning of my plan to make a nice focal point in front of the ugly fence at the back of my butterfly potager garden. I splurged on the largest size columnar crabapple trees so I think I will wait to see if I can find a bench and/or wall decoration at the end-of-season sales. This Dreamweaver columnar crabapple tree is blooming a little early since I just picked it up from the garden centre, but aren't the flowers pretty? And they smell nice too! The foliage will turn a deep burgandy for the summer, and it will even produce edible fruit. This is a great tree for small spaces. The tree will eventually get up to 1 m wide and 3 m tall. There weren't any crabapple trees when I moved into this house and my old house had 4 large ones. I am thrilled to have crabapple flowers in my garden again!! This year I’m going to put in 2 columnar ‘Gladiator’ crabapples. They don’t take up much space and they’ll be tall enough to get sunlight over the fence most of the day, without casting too much extra shade. The spring flowers are gorgeous and the burgundy foliage looks great too and eventually they’ll be tall enough to block the view of the neighbours’ back window and garage. In between them will be a nice bench to sit in the shade and overlook the butterfly potager garden, with some kind of a decorative trellis-y thing above it. I think it’s going to look great! These plants are all attractive to either hummingbirds (bee balm), or butterflies (agastache and verbena). Bees like them too! Here's my first attempt at a bean teepee. I realized when I made it that in order to make the base wide enough for 2 kids to fit under, the tee pee was going to be too short. Next year I'll invest in some bamboo stakes at least 8 ft long. The flowers are finishing now and the beans are starting. I'm not totally sure how long some of these stones will last.� I have a fear that water will get under some of the glass and rocks and eventually crack the concrete.� But for at least�a few years it will be neat for the kids to check how much bigger their hands and feet are getting.� And I did put a 3" base of compacted gravel underneath and surround the stones with sand, so I hope that will help with drainage and make the stones last longer. This completes the gardening projects I wanted to get done this summer, and it's only August!� Except a month or so ago I decided we needed to make a little more space for veggies for next year, so I'll be digging up a little grass this fall...� Anyway, time for a break to just enjoy the garden. Standing on the back porch, helplessly watching the hail pound down on the garden every summer - this has got to be the hardest part about gardening in Calgary!! I can handle zone 3, I can handle the chinooks, I can handle the cold nights and the short growing season and even the freak snowstorms in June and September, all things which make gardening in Calgary notorious. But the hail in July and August, when the garden is at its peak, is just, well, painful. Fortunately, I don't seem to be in much of a hail belt and sustained very little damage. I don't think the tomatoes were impressed, though. After my husband set up the rain barrels, he took the babe and I started staining the new fence. This is as far as I got before it was time to go pick up the kids. This year is my first attempt at a bean teepee. The beautiful bamboo trellis on the right is for peas, and the very rustic, lopsided one on the left is my obviously home-made version for the scarlet runner beans. I saved 5 straight-ish branches from pruning the lilacs last year. There is cedar mulch around the inside so the "floor" doesn't get muddy, and I am wrapping string around the outside to give the beans plenty of things to hold on to as they grow (click on the picture for a bigger version and you just might be able to make out the string), leaving a space at the front for a "door". I planted 5-6 beans around the bottom of each pole. You can also see my trampled raised beds in front. Seedlings seem to be doing fine! 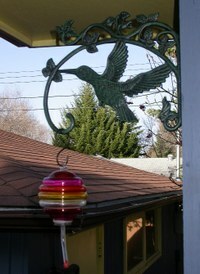 This is new for me this year, but since I am planting a hummingbird/butterfly garden, I'd better have a hummingbird feeder too! According to my Mom, the bird expert, it's time to put the feeders out now as the hummingbirds will be migrating through Calgary soon. Apparently once they find one, they'll return to the same spot year after year. Feeders can be filled with a 4:1 water:sugar solution (eg. 2 cups water, 1/2 cup sugar). Keep them clean and full. For more helpful tips, click on "comments" below for information from Zoe Anne Hinds at http://www.hummingbirdsformom.com. I am placing mine in a diamond pattern because I think they look more interesting. Flowers will go in the triangle between them to make my veggies "prettier". Can you say "potager"? They're made of 1x6's and 2x4's, of untreated cedar.